VITA AKZENT® Plus - Optimizes everything. Effortlessly. 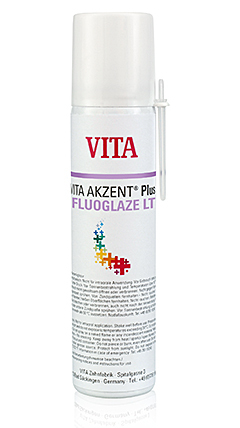 No matter whether internal coloration, surface characterization or fine glazing: with the new VITA AKZENT Plus fluorescent stains, you can adapt your restoration easily and without undue effort. Depending on the user's preferred/customary method of processing and the relevant area of application, VITA AKZENT Plus stains are available as powders and as a ready-to-use pastes. For all types of dental-ceramic materials, for the layering and press technique and feldspar ceramic blocks such as VITABLOCS to monolithic restorations. It is suitable for all dental ceramic materials and for every CTE. At what temperature should I fire VITA AKZENT® Plus stains? The firing temperature always depends on the material to which you apply VITA AKZENT® Plus stains. The temperatures at which you can fire VITA AKZENT® Plus stains range from 780 °C to 950 °C. The firing temperature is generally approx. 10 °C below that of the previous dentine firing. Can I use VITA AKZENT® Plus stain fluid for my AKZENT stains? Yes, this can be used without any difficulty. What is the lowest temperature at which stains can be fired? The lowest temperature for VITA AKZENT® Plus stains is 780 °C. Particularly in the case of glaze materials, however, the level of shine depends strongly on the underlying material. In this low-temperature range, we recommend using GLAZE LT.